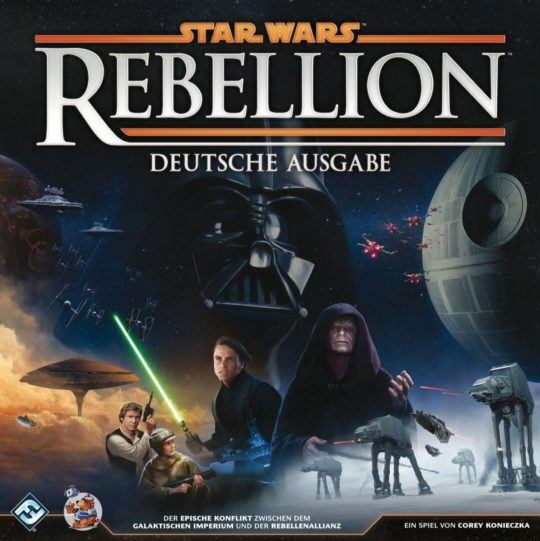 From the publisher: Star Wars: Rebellion is a board game of epic conflict between the Galactic Empire and Rebel Alliance for two to four players! Experience the Galactic Civil War like never before. In Rebellion, you control the entire Galactic Empire or the fledgling Rebel Alliance. You must command starships, account for troop movements, and rally systems to your cause. Given the differences between the Empire and Rebel Alliance, each side has different win conditions, and you’ll need to adjust your play style depending on who you represent: As the Imperial player, you can command legions of Stormtroopers, swarms of TIEs, Star Destroyers, and even the Death Star. You rule the galaxy by fear, relying on the power of your massive military to enforce your will. To win the game, you need to snuff out the budding Rebel Alliance by finding its base and obliterating it. Along the way, you can subjugate worlds or even destroy them. As the Rebel player, you can command dozens of troopers, T-47 airspeeders, Corellian corvettes, and fighter squadrons. However, these forces are no match for the Imperial military. In terms of raw strength, you’ll find yourself clearly overmatched from the very outset, so you’ll need to rally the planets to join your cause and execute targeted military strikes to sabotage Imperial build yards and steal valuable intelligence. To win the Galactic Civil War, you’ll need to sway the galaxy’s citizens to your cause. If you survive long enough and strengthen your reputation, you inspire the galaxy to a full-scale revolt, and you win. Featuring more than 150 plastic miniatures and two game boards that account for thirty-two of the Star Wars galaxy’s most notable systems, Rebellion features a scope that is as large and sweeping as any Star Wars game before it. Yet for all its grandiosity, Rebellion remains intensely personal, cinematic, and heroic. As much as your success depends upon the strength of your starships, vehicles, and troops, it depends upon the individual efforts of such notable characters as Leia Organa, Mon Mothma, Grand Moff Tarkin, and Emperor Palpatine. As civil war spreads throughout the galaxy, these leaders are invaluable to your efforts, and the secret missions they attempt will evoke many of the most inspiring moments from the classic trilogy. You might send Luke Skywalker to receive Jedi training on Dagobah or have Darth Vader spring a trap that freezes Han Solo in carbonite!